Sting Entertainment/Altus’ Department of Heaven is a five episode tactical role-playing series with two spin-offs. Episode II: Yggdra Union (Yggdra Union: We’ll Never Fight Alone) takes players to an unnamed continent during the Yggdra War. The Bronquian army has launched a brutal worldwide campaign, seizing territories until Princess Yggdra Yuril Artwaltz, leader of one of the conquered countries, leads a counterattack. 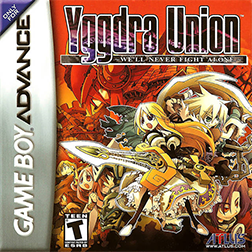 This episode has multiple spin-offs, including an entire sub-series that includes Yggdra Unison, Blaze Union, and Gloria Union. Yggdra Unison builds an alternate universe to the main game, and has a dozen potential heroes to control. Blaze Union is Yggdra Union’s prequel, and is set in Bronquia a couple years earlier. Gloria Union is a pirate adventure installment unrelated to the other games.